Even after a few months, I remain conflicted. On the one hand, it made complete sense. On the other hand, it was like deserting a trusted friend. The decision didn’t come out of the blue and no one in my riding circle (is there such a thing as a “riding circle?”) was taken by complete surprise. After seven years of taking me to magical places like Jasper, Alberta, Montana’s Glacier National Park, and Zion National Park (four times! 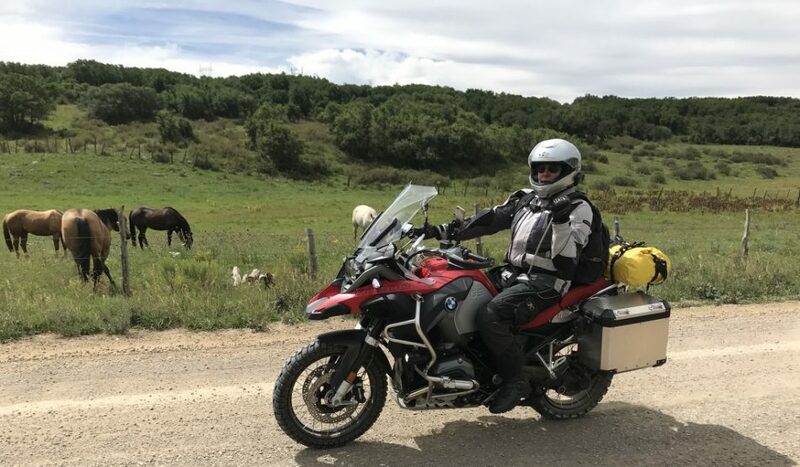 ), or on adventures both good and bad along the Backcountry Discovery Routes http://www.backcountrydiscoveryroutes.com (see earlier post: Smoothtah), or simply hauling me to work on a near-daily basis, I sold “Baby,” my 2008 BMW R1200GS. In her place, I acquired a 2012 BMW K1600GTL, name TBD (these things have a way of presenting themselves). I mentioned in an earlier post that I was considering making a change. Baby was/is a fantastic machine, capable of flying down the highway at 85 mph, or nimbly navigating around — and occasionally over — toolbox-sized rocks on a choppy dirt road. BMW designed the GS family of bikes specifically for this multi-purpose role, although most GS owners only go over dirt when they hit some road repairs in the parking lot at Starbucks. Following our epic ride to Canada and back last summer, I became convinced that Dee and I would need a larger, more comfortable touring platform for our future 2-up travels. The BMW K1600GTL is the state-of-the-art in touring motorcycles and is the largest bike in the current BMW inventory. It has a six cylinder, 1.6 liter motor that cranks out 160 horsepower. The bike is ridiculously fast, yet very smooth and quiet. You can have a normal conversation with the passenger in the cockpit — at 65 mph. In addition to ample side-mounted panniers, the GTL has a top box that serves as a trunk for gear and backrest for the passenger. There are multiple ride modes that adjust throttle response and suspension pre-load (rain, road, dynamic, single rider, 2-up, with/without luggage, etc.). The seat is heated, the windscreen is adjustable (you can select the number of bugs you’d like to receive), there’s cruise control and a complicated audio system that I have so far ignored. Baby, all cleaned up and ready for sale. The new owner, a lucky guy named Bob, doesn’t ride much and never on the dirt. Bye, Bye Baby! Our new “adventure bike,” a 2012 BMW K1600GTL. I know, I know… a heated seat seems excessive — until you try it on a cold day. The new license plate on the GTL. Some of you get it. The rest of you will be hearing about it soon. So there it is. I’ve traded an adventure motorcycle for a two-wheeled luxury resort. Now it’s time to take her out on the open road. Watch for my next post, “The Baja Ya-Ya” as the adventure continues.